With a convenient web interface and a flexible design, the Zenoss monitoring tool is winning converts around the world. Zenoss has an impressive list of features that seem to grow every month. The tool does a great job as a status monitor, and it even supports Nagios plugins. The Zenoss system is also good for monitoring performance and trending (Figure 1). The tool comes stocked with defaults for various types of devices, such as Linux boxes, switches, routers, and even Windows machines, and additional features are easy to add. In the grand tradition of *nix environments, Zenoss is designed with a modular architecture. To add new functionality, just plug in a new module (a ZenPack, in the parlance of the Zenoss masters). Figure 1: Zenoss performance graphs help you study trends and project future needs. One function I find especially useful is Zenoss' syslog server. Zenoss will take standard syslog output and act as a syslog server. This means that, in addition to checking status and monitoring performance, you can also view log information, which is often the best way to see cause and effect. Your Windows machines aren't left out of the logging loop either because Zenoss handles Windows event logging via WMI (Windows Management Instrumentation. Zenoss supports monitoring and management technologies such as SNMP, WMI, ping, portscan, and ssh-based monitoring. SNMP is the defacto standard for garnering network information, and virtually all computing or networked devices support SNMP. For devices that don't use SNMP or WMI, or that are beyond the access of conventional monitoring tools, you can perform limited network tests with ping- or portscan-based monitoring. Monitoring via ssh lets Zenoss connect to a machine and execute commands to determine a machine's status. Network monitoring occurs for a number of reasons, but the most common is the desire to know when something goes awry. In addition to watching for failures, monitoring can also help predict a failure or avoid an unwanted event. Knowing, for instance, that the disk on your mailserver is at 95% of its capacity permits you to add more disk space before a problem occurs. Another benefit of network monitoring is that it helps you plan growth. For instance, trending that looks back in time and provides historical data will let you know that mail is increasing by 10% a month and that, in n months, you will need a new mail server. Historically, monitoring applications have focused on one of three areas. Status monitoring is the most well known form, particularly since Nagios has appeared as an important status-monitoring application. Status monitoring essentially answers yes or no to questions like, "Is the mail daemon up?" This functionality is the core of most network management systems. Performance monitoring, or trending, is the next most common type of monitoring, and RRDtool is the performance application that immediately jumps to mind. A performance monitor tells you that your CPU has been at 20% utilization for the past 6 months but has suddenly increased to 80% over the past week. This information is particularly useful for gauging things like bandwidth usage. The final form is log monitoring. Virtually all applications generate logs that provide insights into what is happening and what is going wrong. These tools together are a network monitoring system. Zenoss offers several avenues for communicating network information. The first option is the web interface. The most useful view of what is happening on your network is the Event Console (Figure 2), which provides an interface for viewing and configuring monitoring events. 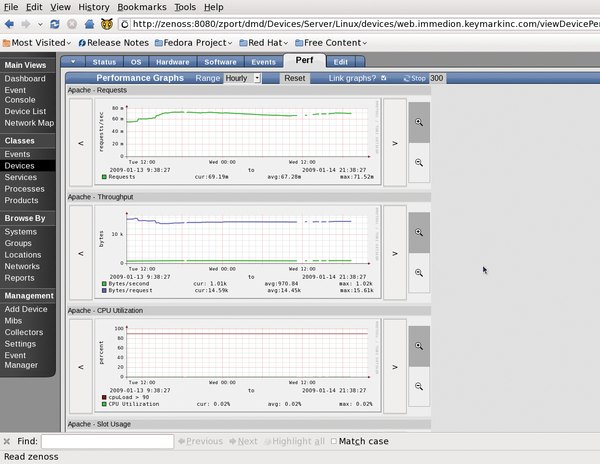 Figure 2: The Event Console provides a view of monitoring events. Most people, however, are not likely to be watching the event console all of the time. Thankfully, Zenoss can push out alerts to SMS and email. What's really fabulous is the granularity you can apply to alerts. For instance, a mail admin might want to know about a problem with a mailserver anytime, but other network problems only during the business day. 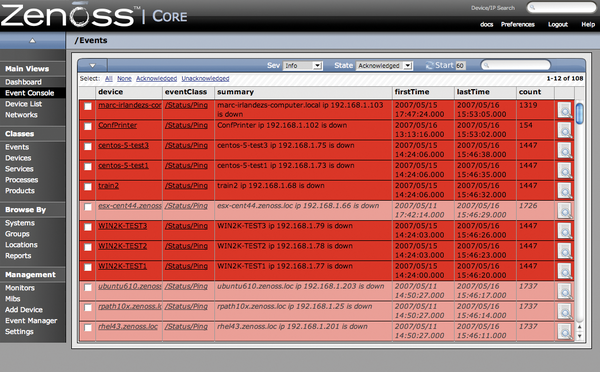 Zenoss makes it quick and easy to configure a range of alerts for a range of different events. Another Zenoss tool for viewing network data is a desktop applet called Zapplet. This applet provides status and event information in your system tray. Zapplet runs on just about anything that supports Gtk2.